Middle-class people from North England band together in Mike Leigh’s Peterloo. Written and directed by Mike Leigh. With Rory Kinnear and Maxine Peake. Opens Friday. 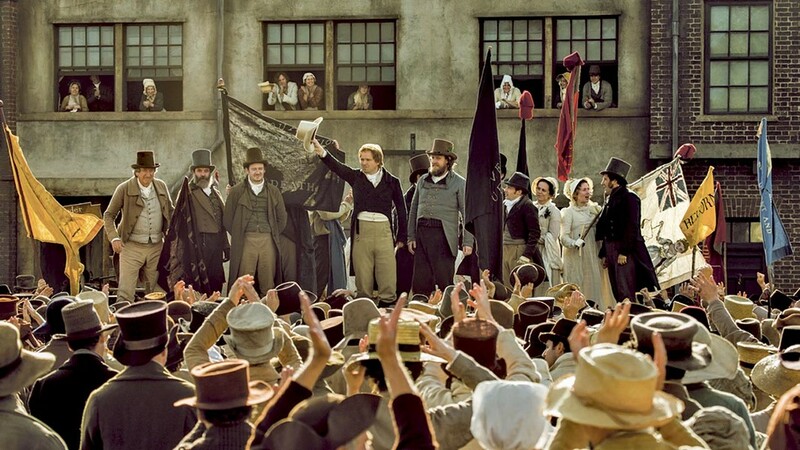 Just in time for the late stages of the seemingly never-ending Brexit debate comes Peterloo, writer-director Mike Leigh's dramatized account of the 1819 Peterloo Massacre in Manchester, England, in which soldiers of the British crown charged into a large crowd of peaceful protesters who were demanding universal suffrage and equal representation, killing 15 and injuring hundreds. Then as now, working and middle-class people — in this case from the North of England — band together in frustration at their lack of a democratic voice in the government and take to the streets. The authorities, fearful of another French Revolution and violently dismissive of common people's complaints, over-react to a grassroots civil rights movement by sending in the cavalry. The leading English public figures of the day take part in the decision, but it's the ordinary folks who get most of the spotlight, amid a long and borderline tedious succession of meetings, in Parliament and elsewhere, on both sides of the issue. The film weighs in at 154 minutes, and could stand to lose about 30. In the seams between set pieces is where Leigh's lavishly costumed history lesson makes its points. The focal character is arguably Joe (David Moorst), a shell-shocked veteran of the Battle of Waterloo who returns home to Manchester and is unable to find work, even at the region's textile mills. Champion of the reformers is Henry Hunt (Rory Kinnear), a full-voiced orator pledged to non-violence. Women's groups include mill both workers and middle-class housewives — even though the working-class women cannot understand the highfalutin vocabulary of the ladies. On the other side are a cabal of magistrates, constables, generals, soldiers, spies, government ministers, the House of Lords, and the Prince Regent (Tim McInnerny), aka Prinny, a lipsticked booby who doesn't know where Manchester is, obliviously sipping wine with his consort, Lady Conyngham (Marion Bailey). The ruling class panjandrums are prepared from the first stirrings of the "middle-class radicals" to read them the Riot Act, and they do. Beaver top hats prevail, as does much cursing of blackguards.